As we went to press, Alvechurch FC were sixth in the league with two games in hand, and still hoping to make the play-offs. The team had a rather depleted February with only three matches played. The well-documented postponement away at King’s Lynn was followed by two must-win home games. Basement club Bedworth Town visited Lye Meadow and a dominant ’Church performance secured the points with a comfortable 3–0 victory, the highlight being a superb goal by Taylor Morrison. This was followed by a performance against Biggleswade Town that many claimed was the best under the current management team. A 2–1 victory was the least they deserved against a very strong side that had beaten AFC convincingly earlier in the season. The one blip during the month was a disappointing 2–0 defeat away at Leiston. 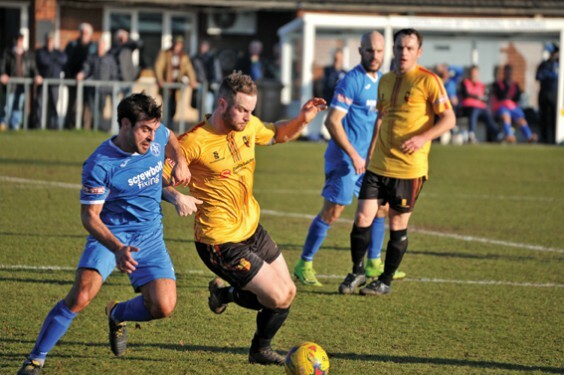 In a game of few chances, two Alvechurch errors gifted the opposition their goals and it was a long journey home for everyone who made the 400-mile, eight-hour round trip to the east Sussex coast. March began with a 1-1 draw at play-off rivals AFC Rushden & Diamonds, then an important 4–2 home win over struggling Lowestoft Town. Unfortunately the rearranged fixture at King’s Lynn ended in a 1-0 defeat. The vital away game against Stourbridge FC has been switched to Friday April 19 (Good Friday), with a 7.30pm kick-off. Stourbridge have wanted to experiment with Friday night football and asked for a switch, and ’Church were happy to oblige. Due to continued success on the pitch, Lye Meadow must be constantly upgraded to keep up with FA ground regulations. At each level, the ground has to meet more stringent rulings. The main stand has been extended to accommodate more seating and the changing rooms have been enlarged to new regulations ensuring step 3 football will be played at Lye Meadow next season. * Alvechurch FC won the league’s Team of the Month award for the first time thanks to their success in January. Despite losing to Banbury on New Year’s Day, a run of good results secured 13 points from a potential 18. Brothers Kyle and Taylor Morrison both won awards for February.Central defender Kyle was declared Player of the Month, a testament to his recent dominant performances. Taylor scooped Goal of the Month for his strike in the vital 3–0 win against Bedworth – a strong run down the left flank before cutting in and shooting across the keeper. Alvechurch have bolstered their forward line by signing Joe Phillips from Welsh League side Aberystwyth Town. Joe has been training with Alvechurch for several weeks but had to wait for clearance from the Welsh FA before making his debut. With the long term injury to Lee Chilton, Joe is a welcome addition to the squad. The midfield has also been strengthened by the signing of Tom Tonks from Stourbridge FC. As well as offering different options in midfield, he also takes a long throw-in which is yet another attacking threat. Manager Ian Long wants to add more firepower, and has put in a seven-day offer for proven goal scorer Levi Rowley, currently playing for Bedworth United. If this bid is successful he could play a vital role. Former Alvechurch under 18s manager Tyrone Henderson and first team coach Oliver Harthill have taken over the management role at Midland Football League Division 1 side Littleton FC. The pair have already made an impact with experienced new signings and climbing out of the relegation zone with some impressive results.